”When state, church and people live together in harmony and pray together, God will bless them” Metropolitan Simeon of Western- and Central Europe said during the prayer in the church of Sts. Vincent and Anastasius near the Trevi fountain in Rome, which was given for use in the orthodox church services of the Bulgarian Orthodox Community in Rome by Pope JOHN PAUL II in connection with his voyage to Sofia last year. urch and people live together in harmony and pray together, God will bless them” Metropolitan Simeon of Western- and Central Europe said during the prayer in the church of Sts. Vincent and Anastasius near the Trevi fountain in Rome, which was given for use in the orthodox church services of the Bulgarian Orthodox Community in Rome by Pope JOHN PAUL II in connection with his voyage to Sofia last year. This was symbolical both for the two delegations from Bulgaria, the delegation of the Bulgarian state headed by Bulgarian Prime Minister Simeon Saxe-Coburg Gotha and the delegation of the Bulgarian Orthodox Church of 6 metropolitan bishops praying together in church, as well as for the work of the Saints they honored: Sts Cyril and Methodi. ”Today we celebrate the memory of Sts. Cyril and Method, 2 apostles of Christianity: Their teaching constitutes for the Bulgarians the basis of their national renewal but also for all Europeans a bridge between the Christians in East and West. Sent by the Eastern christian leader, the Patriarch of Constantinople but also blessed by the Western Christian leader, the Pope of Rome they showed the power of Christianity breathing with two lungs. But also for uniting Europe they show us a model of blessed cooperation. Living a life following the principal "Unity in Diversity" they were the first spiritual architects of the road leading to our common european home." Metropolitan Simeon recalled last year´s visit of pope John Paul II: "This visit has left unforgettable memories in the history of our country. It has reminded the faithful as well of the Eastern as of the Western church not to quarrel over points of division but to celebrate our fundamental unity." Cardinal WALTER KASPER, the president of the Pontifical Council for Promoting Christian Unity answered, that "a door of hope has been opened ... more and more christians in East and West realizing that our century should not lead us to live in solitude, in isolation, in ignorance of the others but that the social, political and cultural developments of our time specially in Europe encourage us to open us towards the other half (of Europe and of Christianity). The cooperation between our 2 churches should expand and enlarge the space of communion we are both longing for ... " Cardinal Walter Kasper concluded. This cooperation was also symbolized by the church in which they prayed. Whereas Pope John Paul II donated the church building, the delegation from Bulgaria brought the icons for the iconostasis: the Holy Brothers Cyril and Method, Saint John the Baptist and of course our Lord and Saviour Jesus Christ and the Mother of God. During the service Bulgarian Prime Minister Simeon Saxe-Coburg Gotha said the creed and the Bulgarian Orthodox Clergy sang the prayers. Bulgarian Orthodox Metropolit Simeon of Western- and Central Europe was joined by the protosyncel of the Bulgarian Orthodox Diocese of Western- and Central Europe Archimandrite TICHON and the members of the delegation from Bulgaria: Metropolitan KALINIK of Vraza,. Metropolitan DOMETIAN of Vidin, Metropolitan KIRIL of Varna, Metropolitan GRIGORI of Vel.Turnovo, Metropolitan GAVRIIL of Lovech, Deacon IVAN and Priest MINA from Sofia. The members of the delegation from Bulgaria and Metropolitan Simeon were later on received in audience by Pope John Paul II. Bulgarian Prime Minister Simeon Saxe-Coburg Gotha presented a replica of famous Krupnik Evangile to Pope John Paul and the order of “Stara Planina” to Vatican Secretary of State Cardinal ANGELO SODANO. Next day morning Prime Minister Simeon Saxe-Coburg Gotha opened a memorial remembering last years papal voyage to Bulgaria. In the Vatican gardens 3 giant pebbles from the “Golden Bridges” area of Sofia´s Mount Vitosha and prepared by the bulgarian artist professor TODOR BARADSHIEV symbolize the Christian virtues of Faith, Hope and Love. The prayers at the opening were led by Metropolitan GAVRIIL of Plovdiv and attended by all members of both Vatican and Bulgarian delegations – together with the Metropolitan bishops of the Holy Synod of the Bulgarian Orthodox Church prayed the three Roman Catholic bishops of Bulgaria. Already at Easter Cardinal Walter Kasper, president of the Pontifical Council for Promoting Christian Unity, visited with the Bulgarian Orthodox Christians of Rome, who - in the presence of the ambassadors of Bulgaria to the Vatican and to Italy, as well as the ambassadors to the Vatican of Serbia-Montenegro and Macedonia had gathered to celebrate the first Easter services presided over by Archimandrite TIHON, protosyncel of the Bulgarian Orthodox Diocese of Western and Central Europe. The cardinal addressed the Bulgarian Orthodox and stated: "You Orthodox and we Catholics do not have the same Easter date, but we share the same Paschal faith". 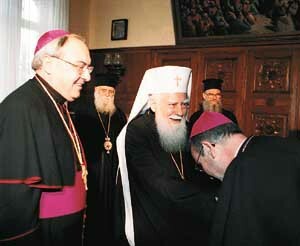 The cardinal said as well that John Paul II's visit greatly improved the relation between the Roman Catholic Church and the Bulgarian Orthodox Church. After the Pope's visit Cardinal Kasper had returned to Bulgaria for several visits of monasteries and parishes. "We made friendships. And for me, friendship and trust are at the base of theological dialogue." Cardinal Kasper also referred to the role of Bulgarian Orthodox in Europe, a continent united by a Christian spirit: "The Holy Father always says that the Church, but also Europe, must breathe with two lungs." "Bulgarians have much to give, because they have a spiritual richness, especially in St. Cyril and St. Methodius, who come from Bulgaria and represent all the Slav peoples," the cardinal explained. The cardinal president of the Pontifical Council for Promoting Christian Unity added: "We must collaborate, because we Westerners, who are secularized, need this spirituality, but they likewise have need of our help." It is in this spirit, that the Pontifical Council for Promoting Christian Unity organized a symposium of Catholic and Orthodox theologians and representatives, held in the Vatican from May 21-24. Metropolitan DOMETIAN of Vidin, member of the Bulgarian Orthodox delegation told Vatican Radio: "… Approach between the Catholic and Orthodox Churches has matured, … as the needs of our age are being anticipated. I think that the Orthodox Church, by its nature, faith and spirit, is very close to our brothers of the Catholic Church"
President Georgi Parvanov and PM Simeon Saxe-Coburg-Gotha this year will attend the Easter service at the Saint Alexander Nevski Patriarchal Cathedral to be celebrated by Patriarch Maxim, sources form the Holy Synod of the Bulgarian Orthodox Church said. President Parvanov accompanied by his wife and the Prime Minister (Zar) Simeon also accompanied by his wife and his sister Princess Marie-Louise. Ognian Gerdjikov, Chairman of the National Assembly, is also expected to attend the service. "Performing this act, the top Bulgarian statesmen give a clear sign that an end should be put to the schism," priests elaborated. "It is an undisputable recognition of the Bulgarian Orthodox Church on behalf of the power-vested," said Associate Professor Ivan Zhelev, head of the Department of Ecclesiastical Matters with the Council of Ministers, who will also attend the service at Alexander Nevski Cathedral. The newly elected President Georgi PARVANOV chose to speak his oath of office not only on the constitution but also in front of the Holy Gospel and the Holy Cross and in the presence of Bulgarian Patriarch MAKSIM. This ceremony was restored 6 month ago by Prime Minister SIMEON SAKSKOBURGGOTSKI (Zar SIMEON who reigned Bulgaria in his childhood allready). 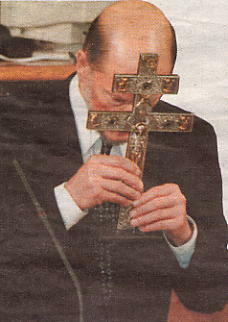 Now it is even more remarkable that the former head of the Socialist Party Georgi Parvanov followed this example. 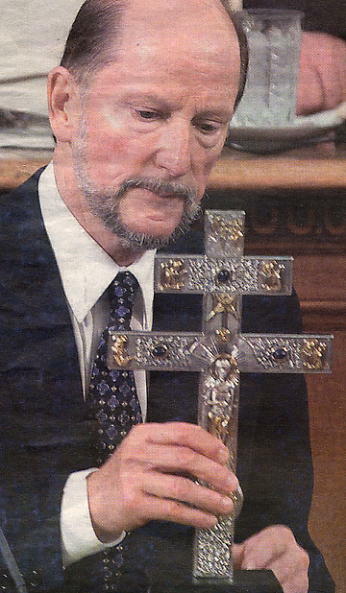 Since the end of Communism he is the first president of Bulgaria to take oath of office on the Gospel and Holy Cross, not only on the Constitution and not only in the National Assembly but in the presence of Bulgarian Patriarch Maksim. Bishop Neophyte from the Holy Synod informed that Patriarch Maksim and the Metropolitans thoroughly read the protocol sent from the President's Office. "Georgi Parvanov was baptized, he is Orthodox Christian, so we see no reason to refrain putting the Holy Gospel and the Holy Cross in front of him", the bishop explained. For the ceremony Bulgarian Orthodox Church has chosen an exceptionally valuable silver-encased example of the Holy Gospel having been printed in 1926 in Istanbul (then seat of the Bulgarian Orthodox Patriarchate). Delegation from Vatican headed by Archbishop LEONARDO SANDRI visited Bulgarian Orthodox Patriarch MAKSIM. Preliminary talks were held in Sofia last Nov. 27 by the papal chief of protocol Mons. RENATO BOKARDO and the Apostolic Nuncio Archbishop ANTONIO MENINI with the Bulgarian Orthodox Church and the Muslim Community. As a result of a meeting with Bulgarian Patriarch Maksim the General Secretary of the Holy Synod Archimandrite Boris informed that Pope JOHN-PAUL would be welcome to meet the Patriarch and the Holy Synod of the Bulgarian Church. In recent years bulgarian politicians have always pronounced the usual invitations, Pope JOHN PAUL had always responded positively provided a friendly attitude of the Bulgarian Orthodox Church would be granted. Now Bulgarian Foreign Minister Solomon Passi declared with special referring to the wish of Prime Minister Zar Simeon that "the new Bulgarian government supports the visit and will make the greatest efforts" to receive the Pope. The Apostolic Nuncio Archbishop ANTONIO MENINI since many years worked continuously in this direction. Visits to Sofia by Bishop Dr. JOSEF HOMEYER of Hildesheim (Germany) organized by Monsignore Dr. NIKOLAUS WYRWOLL of the Catholic Institute for Eastern Churches in Regensburg favoured a postive atmosphere between the two churches. As the Bulgarian Orthodox Church sees it the program for this visit should be prepared by a joint commision of the Bulgarian Orthodox Church and the Catholic Church in Bulgaria "working synchronized with the Bulgarian Government to give a good example of the hospitality of the Bulgarian People and the Bulgarian Church. 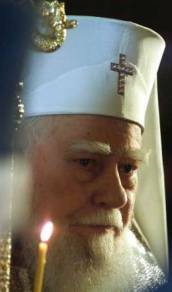 For the Roman Catholic Church Bulgaria is very much linked to the commemoration of later Pope JOHN XXIII who had witnessed bulgarian orthodoxy during his years as Nuntius in Sofia. This is also in the center of a movie now prepared in Bulgaria by an italian and US film team. Specially coming on May 23 to 25 for the occasion of the feast of St.Cyril and Methodi (with St.Benedict together co-patron saints of Europe) the ancient Christian tradition of Bulgarian Orthodoxy as cradle of Eastern, Northern and Southern Slav Christianity will be honored by the Holy Father. Only 2 % of the bulgarian christians are catholics (approx. 90 % of western rite / 10 % of byzanine rite). Recently growing over 2 % are considered protestants (over 20 different registered denominations) but 96 % of the christian believers still belong to Bulgaria´s traditional Orthodox Church. Christians today represent over 80 % of the Bulgarians. Mourning relatives and friends of sevven teen-agers and children killed in a stampede outside a disco left flowers and lighted candles Saturday near the icy stairs where they died. Some of those waiting in line to enter the disco Friday evening slipped on the slick, winding stairs leading up to the club's entrance and were trampled as the crowd behind continued to push forward. Six girls and one boy, ranging in age from 12 to 18, died. Four were seriously injured and dozens suffered lighter injuries. Nadezhda Gavrilova, an official of Sofia's emergency hospital, said 13 youngsters remained in intensive care Saturday. ``All of them, including the four who were in a critical condition, are conscious now and their conditions are improving,'' she said. Most youngsters are so shocked that they can't recall exactly what happened, Gavrilova added. Outside the club, crying people were hugging each other Saturday. Many lighted candles and stuck them in the snow, or left flowers. Iglika Georgieva, a mother of a teen-ager, laid white carnations next to the stairs. ``My daughter was lucky. She has the flu and remained home, but I'm here because this could had happened to her,'' she said. Friday Dec. 21 was the last day of school before christmas and about 3,000 teen-agers and children had hoped to celebrate at the Indigo's popular ``daytime disco,'' which caters to a young audience and closes at 10 p.m. The club holds up to 4,000 people. Police on Saturday detained and questioned the club owner, Angel Nikolov. The government declared Sunday an official day of mourning, and the mayor of Sofia canceled all pre-Christmas celebrations in the capital. Sofia's main Orthodox church, the Alexander Nevski cathedral, was crowded with people during a memorial service for the victims Saturday. In parliament, lawmakers opened Saturday's session with a minute of silence for the victims. ``Bulgaria is shattered by the tragic events. Every death brings pain, but when it comes to children there are no words to express this pain,'' parliamentary speaker Ognyan Gerdzhikov said. Copyright © 2001 The Associated Press. All rights reserved. for worldwide needed interreligious cooperation. In bilateral cooperation minority religion will be mutually supported. Head of Turkish Muslims visits Patriarch Maksim in Seat of Holy Synod. In the time of stress on interreligious relations after the incidents of Sept. 11 it is specially valuable that negotiations between institutions in Bulgaria and Turkey have reached results to the mutual benefit of orthodox christians in Turkey and muslims in Bulgaria. Bulgarians will receive permition invest in keeping up 2 Bulgarian Orthodox churches in Istanbul (among them famous Sv. STEFAN, cradle of the rebirth of the Bulgarian Orthodox Church in the 1870´s) and to restore to regular service the 1880 built Sv. GEORGI Bulgarian Orthodox church in Edirne. The conclusions of the agreements were announced during a visit to Bulgaria of 11 members of the Turkish parliament headed by the Head of Muslims in Turkey. They met the chief mufti of Bulgaria Selim Mehmed and together were invited to Ramazan dinner with Prime Minister Zar Simeon of Saxe-Coburg and Gotha in the 'Boyana' residence. The event was also attended by bulgarian governments ministers Mehmed Dikme and Nedjet Mollov and almost all MPs from the Movement for Rights and Freedom (the party of the bulgarian ethnic turks). Attending the event at 'Boyana' were all ambassadors from the diplomatic corps of the Islamic countries in Bulgaria. Agreement was also reached to send interested bulgarian muslims for religious formation to Turkey to prevent radical famatic ideas to spread from other countries. On Sept. 8, the Feast Day of the Birth of Our MostHoly Mother of God the patriarchs of Bulgaria and Constantinople served jointly at the 'Sveta Nedelya' cathedral in Sofia. Premier Simeon Saxe-Coburg-Gotha attended the service and as usual read out the Credo and was later the first to take the communion. After the service Premier Saxe-Coburg-Gotha and the two patriarchs spent a quarter of an hour in the side altar. For lunch His Holyness Bulgarian Patriarch MAKSIM invited His Allholyness Oecumenical Patriarch BARTHOLOMAIOS and His Majesty Premier SIMEON Saxe-Coburg-Gotha to the palace of the Holy Synod. In the afternoon Oecumenical Patriarch Bartholomaios received Premier Simeon Saxe-Coburg-Gotha in the presidential suite of the 'Hrankov' Palace hotel where he is residing. At the entrance he was welcomed by Metropolitan Emmanuel, representative of the Oecumenical Patriarchate at the European Institutions at Brussels, who led him to the suite of the Oecumenical Patriarch. It is normal to talk about the schism in the Bulgarian Church, the prime minister said before the meeting. He, however, did not undertake to explain whether the government would launch any concrete measures to overcome it. After the one-hour meeting Premier Simeon Saxe-Coburg-Gotha specified he had been impressed by how much Bartholomew appreciated the Bulgarian Church. Under the aegis of His Holiness, very good possibilities lie ahead for all the Orthodoxy in general, the prime minister said. Over a cup of tea they also talked over travel plans of Patriarch Bartholomew I and a meeting between the premier and the Pope next year.
" WE MADE EVERY EFFORT to BRIDGE the SCHISM "
"We hope the unity of the Bulgarian Orthodox Church to be restored because the schism is detrimental. Every effort has been made to bring the schism within the Bulgarian Church to its end. Mother Church is always willing to give a helping hand to all the churches like yours. 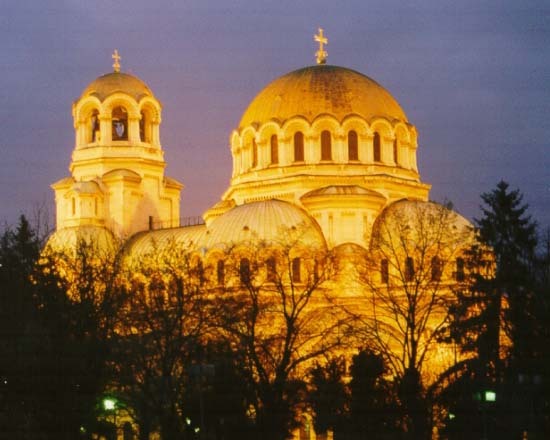 The Bulgarian Orthodox Church is the first-born and favourite daughter of the Oecumenical Patriarchate. Our expectations, prayers and wishes are that we soon celebrate its unity. This is our expectation, as well as the expectation of the entire Bulgarian people. The presence of His Majesty, Bulgaria's Prime-Minister, and his good attitude towards the Bulgarian Orthodox Church and Patriarch Maxim raise our hope that the schism is soon to come to its end." The Patriarch of Constantinopel BARTHOLOMAIOS is attending the scientific conference 'The Byzantine cultural heritage in the Balkans' which is held from Sept. 5 - 8 in the city of Plovdiv, Bulgaria. His Allholyness was welcomed by Bulgarian Patriarch MAKSIM, Metropolitan ARSENIJ of Plovdiv and the Roman-Catholic Bishop Georgi Yovchev. 'Today we should recall the mission of the sacred brothers Cyril and Methodius which is inseparable from Europe's cultural heritage,' the Pope writes. In the letter he calls for 'another evangelization of Europe', in order that it may return to its Christian roots. The address of Pope John Paul II was interpreted as a token of thawing relations between the Vatican and the eastern Orthodoxy. In his speech the Oecumenical Patriarch Bartholomew stressed that today too, the Byzantine civilization should be an example of a peaceful co-existence in the Balkans and tolerance between the religions. 'In this way we could spare our troubled peninsula many of its present problems,' he pointed out. After the opening of the conference Patriarch Bartholomew, Patriarch Maxim and Monsignor Georgi Yovchev prayed in the Plovdiv cathedral of Our Mostholy Mother of God for Bulgaria's well-being. Patriarch BARTHOLOMAIOS of Constantinople calls Bulgarians to Be Open for Papal Visit "Reconciliation with the Catholic Church does not mean a decline in Orthodox dogmas." 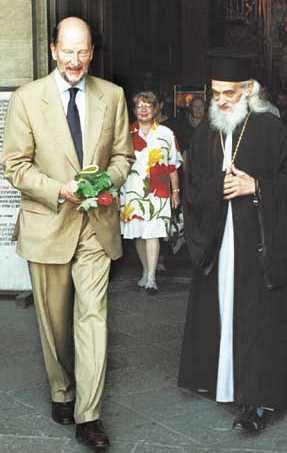 SOFIA, Bulgaria, SEPT. 11, 2001 (Zenit.org).- Bulgarians should receive John Paul II "without prejudice" if, as proposed, he visits the country next year, said Bartholomew I, the Orthodox ecumenical patriarch of Constantinople. "How the Pope is welcomed will depend on the spiritual strength of members of the local Church, but a respectful conduct without prejudice is certainly the best," Bartholomew told Bulgaria's most popular daily, Troud, late last week. Apostolic Nuncio Antonio Menini said last month that the Pope might visit Bulgaria next May, but the Vatican has not officially confirmed the trip. "If the faith of Bulgaria's Orthodox community is strong, then we have nothing to be afraid of, whether it is the Pope or anyone else who is not Orthodox," said Patriarch Bartholomew. "Reconciliation with the Catholic Church does not mean a decline in Orthodox dogmas." The newly elected Prime Minister of Bulgaria SIMEON SAKSKOBURGGOTSKI (Zar SIMEON II. of Bulgaria - from the royal house of Saxony-Coburg and Gotha) is giving another example of christian normality. It is only natural for him to attend church service on sunday and on church feast days. Now being the prime minister of the country and living in the capital city Sofia he will thereby set standards for society. When he last sunday attended church service in the cathedral this fact was judged important enough for the most prestigous daily newspaper of Bulgaria to publish an illustrated article. Though in the St. Alexander Nevski Cathedral there is a representative place for the tsar, where Simeon´s ancestors have attended service, the former tsar now serving as prime minister was humble enough standing among the faithful for the whole service, thereby creating a safety problem for his guards, who now have become regular church goers themselves. The second surprise for the public became visible, when polite church clergy at the time of the creed thought it necessary to bring the text to the prime minister. As the newspaper writes Simeon allready had pulled the text out of the pocket of his jacket and was most naturally reading it with all the other faithfull. After he left the church with the serving patriarchal vicar bishop and renowned church poet and author HILARION the crowd and journalists wanted Prime Minister Simeon to adress the people. He did not give the political speach they expected, but only explained that he was now on his way home to have lunch with the family. Then he apologized to the bishop that despite the sunday he will have to work in the afternoon to go through the 150 papers of the candidates for vice ministers and provincial governors to give the country a working government as soon as possible. The newly elected Prime Minister of Bulgaria SIMEON SAKSKOBURGGOTSKI (Zar SIMEON II. of Bulgaria - from the royal house of Saxony-Coburg and Gotha) is probably not only the first king in history who had the courage to humbly accept to work for his motherland under a republican president but at the same time he took the effort to revive christian traditions. In Bulgaria, one of the oldest christian countries in Europe (first independant christian state in the 8th century), none of the former prime ministers - no matter whether socialist or anti-communist - had the courage to confess his christianity and pledge his oath of service in front of the Holy Cross and the Holy Bible. In the very center of the Parlamentary Assembly and after having spoken the last words of his oath of service, SIMEON venerated the Holy Cross and the Holy Bible for this occasion specially braught to Parliament from the Patriarchal Cathedral. Then he crossed himself and took blessing from Bulgarian Patriarch MAKSIM before accepting first congratulations from the parlamentarians of his broad multiparty-coalition. After the end of the official state ceremony in the Parliament Building Prime Minister SIMEON at the head of all newly sworn-in members of his government went to the Cathedral, where Bulgarian Patriarch MAKSIM held a prayer service to ask God´s blessing for a successfull work to the benefit of the people of Bulgaria. SOFIA, July 24 (Reuters) - Bulgaria's ex-King Simeon II, who became the Balkan state's prime minister on Tuesday, says a sense of duty to his motherland has forced him to enter politics at the age of 63. "This choice is a turning point in my life and I will do all I can for the country and for every Bulgarian," he told parliament before it voted in his government. "Today we are given a real chance to lead Bulgaria into the 21st century and take the place we deserve in the united Europe. "This is the meaning of my life and the reason why I take this heavy responsibility." "I am proud to be a Bulgarian." The first ex-monarch to regain political power in post- communist eastern Europe, he turned 64 on June 16, one day before his National Movement for Simeon II won a parliamentary election in which he voted for the first time in his life. A successful businessman in Spain, he entered politics only in April, after the Constitutional Court banned him from running for president. Simeon Saxe-Coburg, whose huge estates across Bulgaria were confiscated by the communists and returned by the previous government, has consistently denied charges of his opponents that he wants to restore the monarchy. 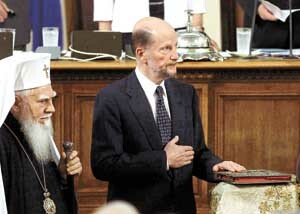 Proposing to the parliament to revive the christian traditions of Bulgaria and to pledge his oath of office on the bible in the presence of the Bulgarian Patriarch Maksim, the spiritual leader of 95 % of Bulgarians, who are of Christian Orthodox faith, was not as easy for Prime Minister SIMEON as it would sound in a country with a long christian heritage as Bulgaria. 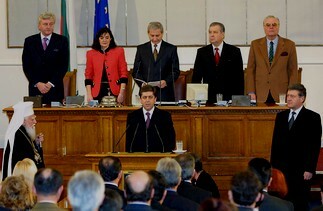 While the members of parliament from the broad multiparty coalition Simeon has gathered around him voted for this ceremony, 17 MPs from the former "anti-communist" government, with the former premier Ivan Kostov among them, voted 'against' whereas 2 MPs from the Socialist 'Coalition For Bulgaria' abstained. The tall, bald and bearded ex-monarch, who speaks several European languages fluently, won popularity on promises of a "new morality" in politics and pledges to uproot corruption. After the ceremony in the parliament building the new cabinet walked to the "Alexander Nevski" cathedral, where Patriarch Maxim himself held a service for the success of the Premier and his ministers. Hundreds of citizens closely followed the ministers to the building of the Council of Ministers. They chanted "Simeon!" and "Many Years !". He will face huge popular expectations after his promise to improve living standards of the impoverished nation of eight million people within 800 days. But to achieve that, he, and his inexperienced ministers will have to learn how to activate the levers of political power. The son of King Boris III of the House of Saxe-Coburg and Queen Joanna of the House of Savoy, he is related to many European monarchs, including Britain's Queen Elizabeth. In 1937 his birth was marked by a 101-gun salute and an amnesty for prisoners and tax evaders. He acceded to the throne at the age of six after his father's sudden death in 1943, ruling through a council of regency. He, his mother and sister Maria-Luisa fled Bulgaria after a rigged referendum abolished the monarchy in 1946. The family first settled in Egypt. In 1951 the Spanish government granted them asylum. At the age of 18, in Madrid, Simeon issued a proclamation re-affirming his commitment to the monarchy. He is a graduate of the Valley Forge Military Academy in the United States. Married to a Spanish aristocrat, Margarita, he gave Bulgarian names to his four sons Kardam, Kyril, Kubrat, Konstantin and daughter Kalina. They have all visited Bulgaria and Kyril is one of President Petar Stoyanov's advisers. His late mother first returned to Bulgaria with Simeon's sister Maria-Luisa in 1993. At all occasions and everywhere in Bulgaria Simeon and the members of his family received an enthousiastic welcome during their numerous visits.